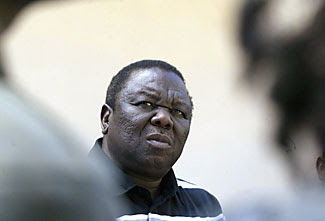 Elsevier reports that Zimbabwe's opposition leader Morgan Tsvangirai has taken up refuge in the Dutch embassy in Hahare. The regime have assured the Dutch Government that the safety of Tsvangirai and the diplomatic staff is guaranteed. After having announced his pull-out out of Friday's runoff election Tsvangirai fled to the embassy on Sunday evening after having been threatened. UN Secretary-General Ban Ki-moon has called on dictator Robert Mugabe to postpone the elections. US Secretary of State Condoleezza Rice said Monday that Mugabe's government cannot be considered legitimate without a fair run-off. There have been frequent reports of extreme violence committed by governing party officials against members of the opposition. Hundreds have been wounded and many have been gruesomely killed. Bridget Johnson on Pajamas has details in "Help the Zimbabwe Opposition Now!". Times Online relays "‘Stop him’ plea to world as Mugabe gets a free run" (contains video material of scenes of mayhem. A Mugabe campaign poster is the dead give-away: "the final battle for total control"). Of Demagogy, Voodoo and Hypnosis 2.0. Wilders Quoting Orwell: like it or not!